a wire mesh cage communicably connected to the open bottom of said housing for receiving the bird therein, said wire mesh cage dimensions so that the openings in the wire mesh are small enough to prevent the bird from escaping, the openings in the wire mesh are large enough for the bird to stick his head through the openings in the wire mesh so that the cat can quickly pull the bird out of said cage with his paw. Patent Reform Act of 2007 – Initiatives Relevant to Prosecution. Considering the likelihood that we may actually see the Patent Reform Act of 2007 become a legal reality this year, this post highlights initiatives in the bills presently before Congress that may be of particular interest to patent prosecutors. Much of the following information may also be found in the CRS Report and the Senate Committee Draft Report previously commented on by the AT!. In an effort to harmonize U.S. law with the rest of the world, the U.S. would shift to a “first-inventor-to-file” from the present “first-to-invent” system in determining which individual has a right to a patent on an invention. Under the “first-inventor-to file” system, an inventor who first files an application at the patent office will be presumptively entitled to the patent. Unlike the present “first-to-invent” system, whether the first applicant was actually the first individual to complete the invention in the field will be irrelevant. The shift will also eliminate “interference” proceedings. Interferences are complex and costly administrative proceedings that, although not commonly used, allow the Patent Office to determine the true first inventor of a contested invention. Notably, the “first-inventor-to-file” system will still prohibit derivation where one individual copies another individual’s invention and then races to the patent office to file first. To prevent individuals from obtaining patents on inventions obtained by derivation, both bills provide for an “inventor’s rights contest” that will allow the Patent Office to determine which applicant is entitled to a patent on a particular invention. Under current U.S. law, a public disclosure of an invention, such as a public use, sale, or publication thereof, starts a one-year clock running in which an inventor must file a patent application or the invention is dedicated to the public domain. According to the present bills, and potentially contingent upon a reciprocal change to European and Japanese patent laws, disclosures will qualify as prior art if they were made by 1) the inventor more than one year before the patent application’s filing date; or 2) a third party prior to the filing date and prior to the inventor’s disclosure. Thus, an inventor would still be protected from losing a right to a patent by the inventor’s own disclosure. However, the grace period would not protected the inventor from an earlier disclosure of a third party. Presently, only an inventor may make an application for a patent. An inventor is also required to declare by appropriate oath or declaration that he or she is the “original and first inventor”. The proposed S.1145 initiative allows, however, that a “person to whom the inventor has assigned or is under an obligation to assign the invention may make an application for patent.” Thus, an assignee-company would be able to file a patent application on behalf of an inventor-employee having an obligation to assign to the company. Post issuance review of an issued U.S. patent is currently conducted by reexamination proceedings (available both in ex parte and inter partes types). To initiate a reexamination, any individual may cite art that raises a new and substantial question of patentability with respect to the issued patent. For a variety of reasons not discussed here, however, reexamination proceedings have been sparingly used. The present bills would provide a “post-grant review” proceeding that would begin, for example, within 12 months of the date the patent was issued. The proceeding would give the patent owner an opportunity to amend to overcome any issues raised. Importantly, a decision from the Patent Office would be required within one year of commencement of the review, and any patent left standing would be protected from a reassertion in other legal proceedings of the issues raised during post-grant review. Most patent applications presently publish 18 months after filing, although an applicant may decide to opt out of publication as long as the applicant certifies that the invention will not be the subject of a foreign patent application. The House and Senate bills would eliminate a possibility of opting out of pre-grant publication. Under the current law, a protest may be filed by any member of the public against a pending application under certain, and very narrow, circumstances (i.e., prior to the first of the date the application was published or the mailing of a notice of allowance). Under the proposed initiatives, any person would be able to submit patent documents and other printed publications to the Patent Office within the later of 1) an issuance of a notice of allowance, or 2) six months after pre-grant publication or the rejection of any claim in the application. The submission would have to include a concise description of the relevance of each submitted document. Under the House proposal, tax planning method patents would be banned. See the previous AT! post on tax-related patents here. Applicants are presently under a duty of disclosure to the Patent Office to indicate any art of which they are aware that may be material to patentability. See a previous AT! article on the duty of disclosure here. The Senate bill would also require that “applicants submit a search report and other information and analysis relevant to patentability”. As compliance with this requirement would be costly (not even to mention the potential for inequitable conduct ramifications), an applicant would be exempted if it would qualify as a “micro-entity”. This determination would be based on an enumerated list of factors including: income level; number of patent applications filed; small entity status; and assignment activity. See the previous AT! article on inequitable conduct here. The H.R. 1908 bill would provide that a holding of inequitable conduct is appropriate only if the patentee, its agents, or another person with a duty of disclosure to the USPTO intentionally misrepresents or fails to disclose material information, such that the USPTO would “have made a prima facie finding of unpatentability.” S. 1145 would provide that information is material if it is not cumulative to evidence already before the Examiner, and “a reasonable patent examiner would consider such information important in deciding whether to allow the patent application.” The standard for proving inequitable conduct would be set at “clear and convincing”. The Patent Office is currently limit to establishing regulations that govern the conduct of proceedings before it, and the recognition and conduct of patent attorneys. The Senate bill would further grant the authority to “set or adjust by rule any fee established or charged by the Office”. The House bill would authorize the Patent Office to “promulgate regulations to ensure the quality and timeliness of applications and their examination”. The language of the House bill could greatly affect the Patent Office’s proposed claims and continuations rules presently being litigated, and that have been enjoined from becoming effective pending the outcome of the litigation. See AT! post on the claims and continuations rules here, here, and here. JW Note: We would be greatly interested in hearing about the concerns of our practitioner-readers relating to the legislation. Leave your comments as you may! CRS Report – Patent Reform in the 110th Congress. The Congressional Research Service (CRS) is a research arm of the United States Congress that has been in operation since since 1914 (first established as the Legislative Reference Service). CRS provides policy and legal analysis to committees and Members of both the House and Senate, regardless of party affiliation. CRS experts assist at every stage of the legislative process, from the early considerations that precede bill drafting, through committee hearings and floor debate, and to the oversight of enacted laws and various agency activities. The report is also surprisingly well balanced, and clearly identifies many of the arguments typically made by parties both pro- and con- particular reform initiatives. We consider this report a “must read” for any practitioner who might want a good overview of the various reforms being considered, as well as rationale and potential pitfalls associated with each. Senator Harry Reid on Patent Reform – A Priority For The First Session of 2008. Once we work these issues out, time permitting, we will also turn to two other priorities in this first work period: patent reform and an energy package. On patent reform, we must carefully strike the right balance with a bill that promotes rather than blocks innovation from enterprising entrepreneurs. The energy package consists of dozens of land and water bills that have already passed the House and the Senate Energy committee by overwhelming bipartisan margins. Among these worthy and non-controversial measures are Senator Murray’s ‘wild sky wilderness’ bill, which she has championed now for more than five years. If not for the obstruction of just a few Senators, we would have passed these bills last year. I am hopeful that the overwhelming majority of Senators – Democrats and Republicans alike – will have their voices heard this year. Hat tips to Zura and Patently-O. See also a previous AT! post on the Draft Committee Report for the Patent Reform Act of 2007 here. Revised Procedure for an Oath or Declaration. If an oath or declaration filed on or after June 1, 2008 does not include the express language set forth in 37 CFR 1.63(b)(3), the Office will object to the oath or declaration as failing to comply with 37 CFR 1.63. A supplemental oath or declaration pursuant to 37 CFR 1.67 will then be required. (b) In addition to meeting the requirements of paragraph (a) of this section, the oath or declaration must also: . . .
(3) State that the person making the oath or declaration acknowledges the duty to disclose to the Office all information known to the person to be material to patentability as defined in § 1.56. (Emphasis mine). Practitioners are hereby put on notice to check and, if necessary, update their oath or declaration forms. JW Note: Rule of thumb in checking your forms: “material to examination” = bad; and “material to patentability” = good. Baldwin Graphic Systems v. Siebert. If an initial phrase carries no definitive numerosity, an anaphoric phrase does not alter the meaning in the slightest. In grammatical terms, the instances of “said fabric roll” in the claim are anaphoric [definition] phrases, referring to the initial antecedent phrase. Because the initial phrase carries no definitive numerosity, the anaphoric phrases do not alter that meaning in the slightest. In relation to the construction of the phrase “sealed sleeve”, the court noted that it has “consistently recognized that the Patent Act prevents an applicant from adding new subject matter during the patent prosecution process.” The record indicated that during prosecution the Examiner had refused to allow the applicants to amend the specification to remove references to “heat” as the way of sealing the sleeve because such amendment would have broadened the patent and introduced impermissible new matter not included in the initial disclosure. Thus, the court was correct in refusing to broaden the term “sealed sleeve” to mean more than a “heat-sealed sleeve”. Scrabulous: Not a Triple-Word Score. According to Reuters, Mattel and Hasbro have recently warned Facebook that the online application Scrabulous may be infringing Mattel and Hasbro’s copyright and, presumably, trademark in relation to the popular board game Scrabble®. If you have not yet been hooked by the Scrabulous phenomenon, consider yourself lucky. Sources indicate that it can be quite addictive. Scrabulous has a registered user base of 2.3 million, 600,000 of which play the game daily. The move to shut down Scrabulous has also prompted a new community on Facebook named “Save Scrabulous”. The “Save Scrabulous” community has over 12,000 members. So is there copyright infringement? Independent creation is a defense to copyright infringement, but only if independent creation is a possibility. If you were to put enough monkeys with typewriters in a room on Mars, for example, they may independently create Shakespeare and have a valid copyright in the work. One test for copyright infringement is access and substantial similarity. The creators of Scrabulous cannot in good faith claim, however, that they never had access to Scrabble®. 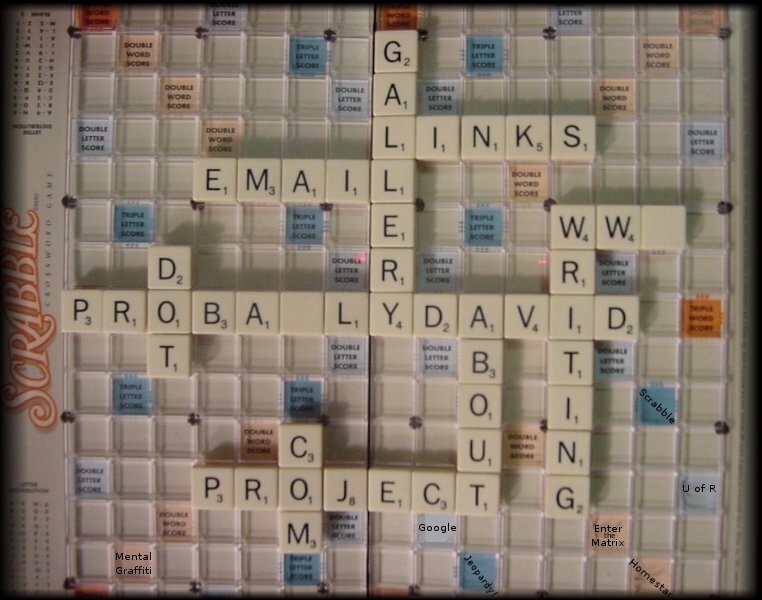 The game of Scrabble® is sold in 121 countries in 29 different languages. One hundred million games have been sold worldwide, and estimations are that Scrabble is found in one out of every three American homes. The copyright infringement is obvious and, in retrospect, the developers of Scrabulous should have done more to create their own spin on it [rather than using the same color schemes and numerical systems and having the rules to Scrabulous game link to the Scrabble Wikipedia page]. You be the judge. Images of the respective games are reproduced below. Access? Check. Substantial similarity? Check. But what about trademark infringement? In trademark law, two words or phrases do not have to be identical for there to be a trademark infringement. An infringement may be found wherever there is a likelihood of confusion as to the source, sponsorship, or ownership of the goods (or services). A likelihood of confusion in this instance appears to be very high. The goods (the game) are nearly identical in the way they are played as well as how they look. Further, the marks themselves are very similar, sharing the same first five letters (S-C-R-A-B). Similar marks? Check. Substantially identical goods? Check. Trademark infringement seems to be yet another obstacle the Scrabulous makers will have to hurdle. So what options do Facebook and/or the creators of Scrabulous (JW Edit – 1/25/2008; good comment tekel) have? The most reasonable recourse may be to consider selling Scrabulous to Mattel/Hasbro, or obtaining a license as soon as possible. Any comments from our readers?